recognition of his famous last name. 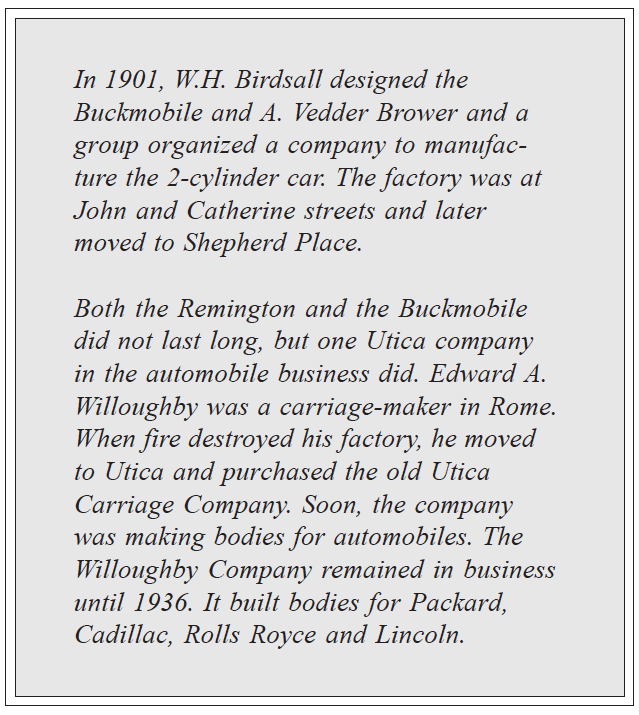 manufacturing a vehicle in his hometown of Ilion, New York. located, on the corner of Morgan and Otsego Streets, Ilion). put out 4 or 6 horsepower, depending upon its configuration. 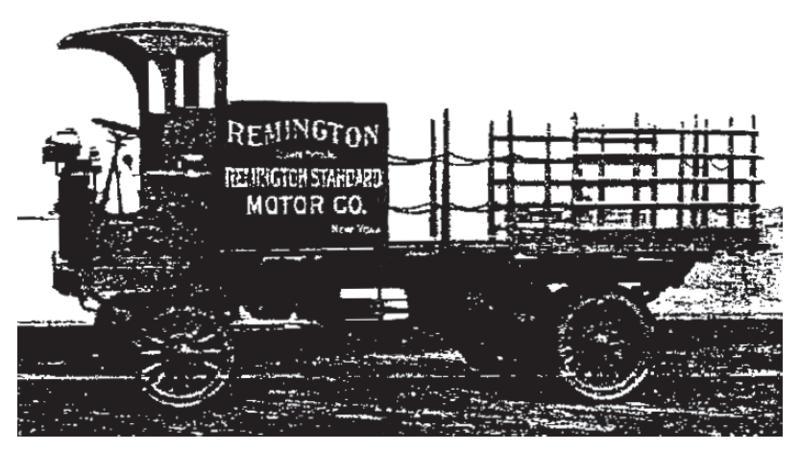 The Remington Automobile and Motor Company informs usthat the streets of Ilion. N. Y., are covered with 18 inches of snow, and that its vehicles, weighing 1,200 pounds, and equipped with a 4 horse power motor, are operating successfully over these streets. January 4, 1901 – the Ilion Citizen In the experimental work which we are doing from day to day with an endeavor to more fully perfect the gasoline motors which we are manufacturing, together with the several devices tributory thereto it, becomes necessary for us to use our demonstration carriage on the streets of the village under conditions most severe. We would respectfully ask the citizens to be particular to tie their horses when leaving them standing, as in the practical operation of our automobile, we find that animals are tempted to become frightened and we desire as far as possible, to avoid any accident through the necessity of frequent road tests of our horseless carriage. 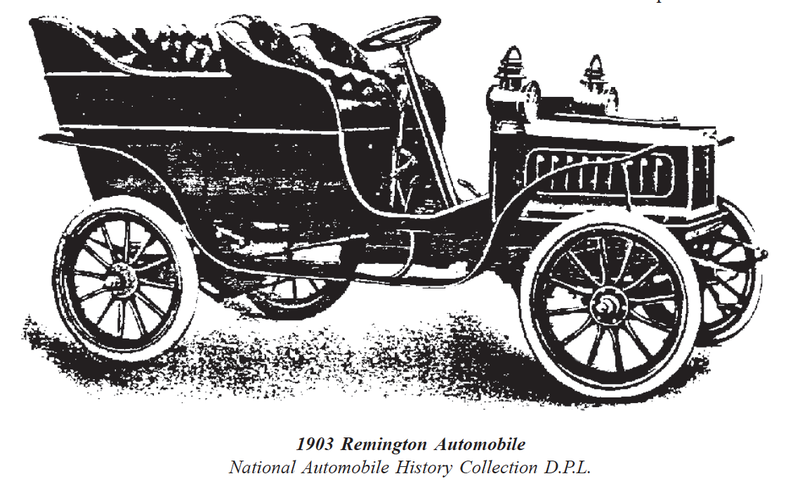 April 17, 1901 – Horseless Age The Remington Automobile and Motor Company expect to locate at Utica, New York. entire operation to 43-45 First Street, Utica, New York. weighed about 900 lbs., and seated either two or four passengers. (Other parts furnished by C. S.
have scared man and beast alike. 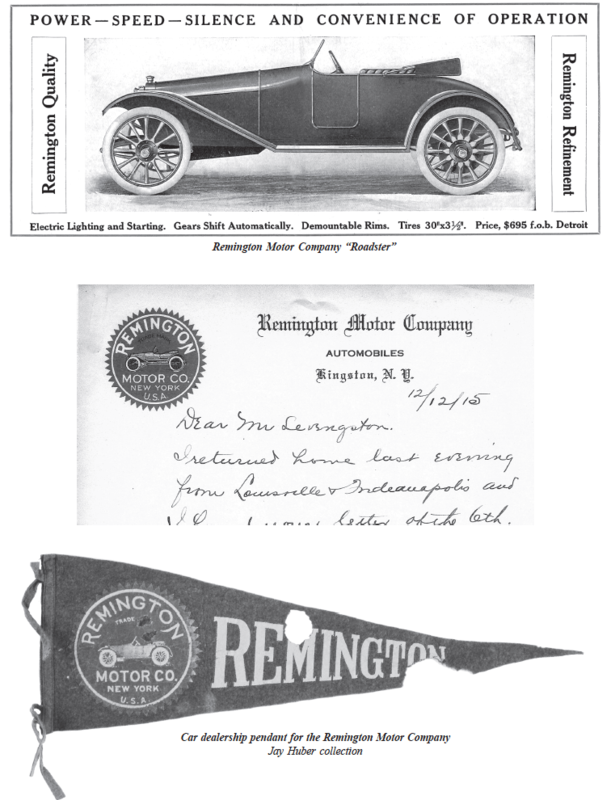 July 1901 – Rudder Remington Standard – A Good Motor with a Good Name. Positioned for either automobiles or launches, Remington Automobile and Motor Co. Utica, NY. 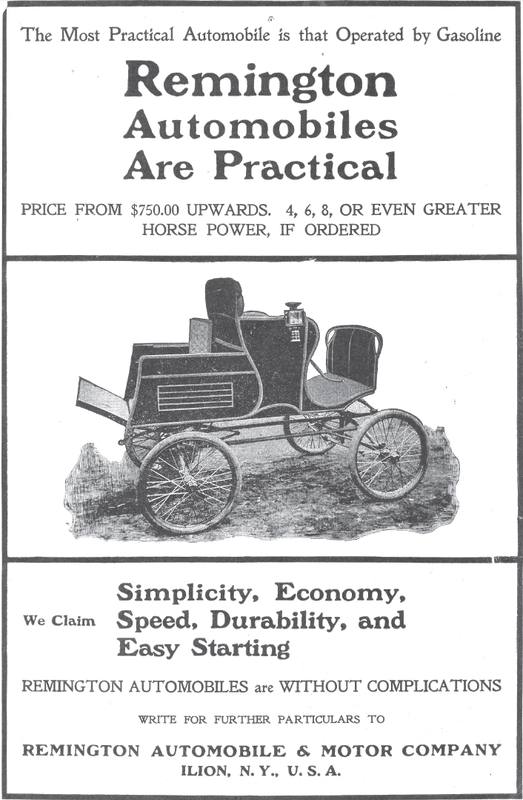 July 3, 1901 – Horseless Age We have received a catalogue from the Remington Automobile and Motor Company, of Utica, N.Y., illustrating and describing the Remington automobiles,launches and motors. Sept 1901 – Auto Review The Remington Automobile and Motor Co., of Utica, N. Y., have brought out a four cycle, two cylinder gasoline motor specially designed for marine work.They have recently equipped a twenty foot boat named the â€œRemingtonâ€ with one of these motors, and the operation has proved satisfactory. It is 4 horse power, and the company intends to manufacture these motors in large quantities in several different sizes and equip yachts and launches of all kinds. 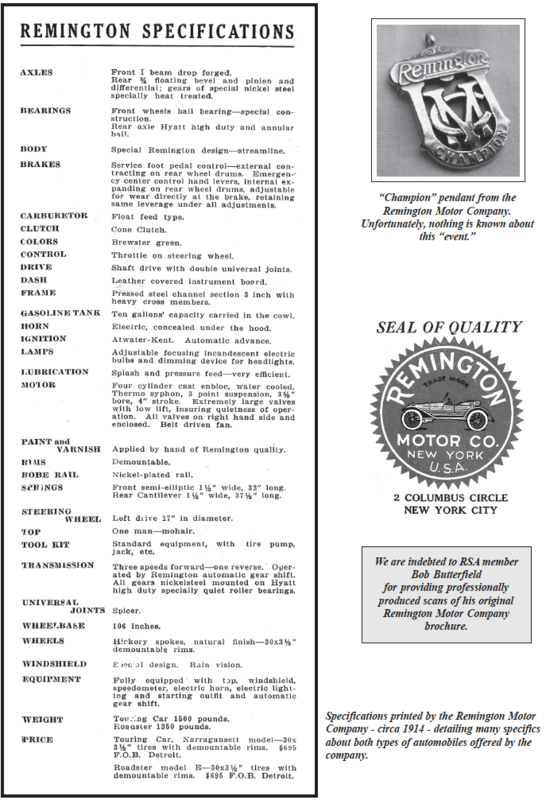 September 1901 – The Auto Way The Remington Automobile Motor Co., manufacturers of the Remington Standard automobiles, launches and motors, are Page 37 4th Quarter 2011 now settled in their new factory at Utica, N. Y. They have just issued a very attractive little catalogue telling all about their products, and it is well worth sending for, as it contains a fund of valuable and interesting information. The same class of fine workmanship is put into Remington automobiles that has made the name a world wide synonym for mechanical excellence in rifles, typewriters and other products of the factory. September 18, 1901 – Horseless Age At the annual meeting of the stockholders of the Remington Automobile and Motor Company held at Orange. N. J., recently the following directors were elected: Philo E. Remington, of Ilion; George I. Dana, Correl Humphrey, G. A. Spaulding. L. M. Graham and J. S. Holmes, Jr., of Utica, and Charles B. Storrs, of Orange, New Jersey. 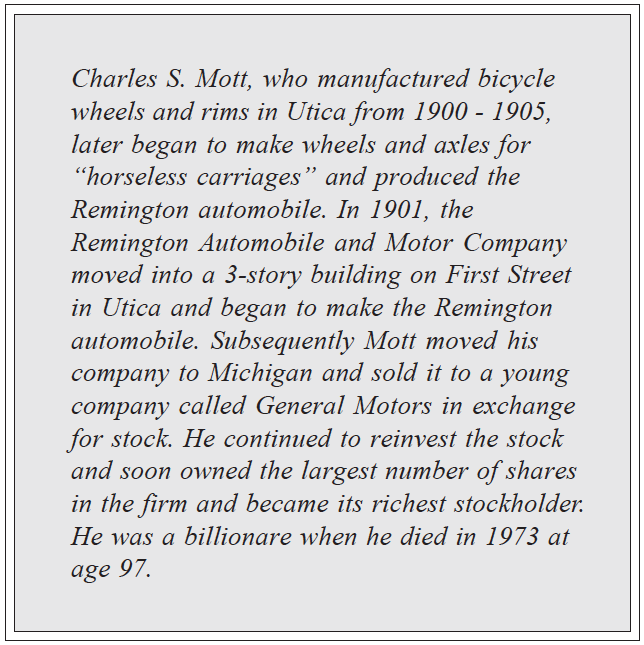 November 27, 1901 – Horseless Age The Remington Automobile and Motor Manufacturing Company of Utica, N. Y., are getting out a 12 horse power tonneau for C. S. Mott, of the Weston-Mott Company, same place. July 1, 1902 – Motor Way Philo E. Remington, president of the Remington Automobile & Motor Co., of Utica, N. Y., states that he left Albany in a 26-foot Remington launch, equipped with a Remington four cycle motor, for the purpose of making a record trip from Albany to New York.The time of leaving Albany it is said was 3:30 a. m., which time is certified to; and the time of arrival at 152nd Street, North River, New York, was 6:30 p. m. the same day, which arrival is likewise certified to. Mr. Remington reports that the motor never stopped once during its entire trip, thus having run continuously for fifteen hours during the entire distance of one hundred and fifty miles. It is stated that the company have recently made a gasoline consumption test of that same boat with the results that twenty gallons of gasoline were used in traveling three hundred and twenty-five miles. 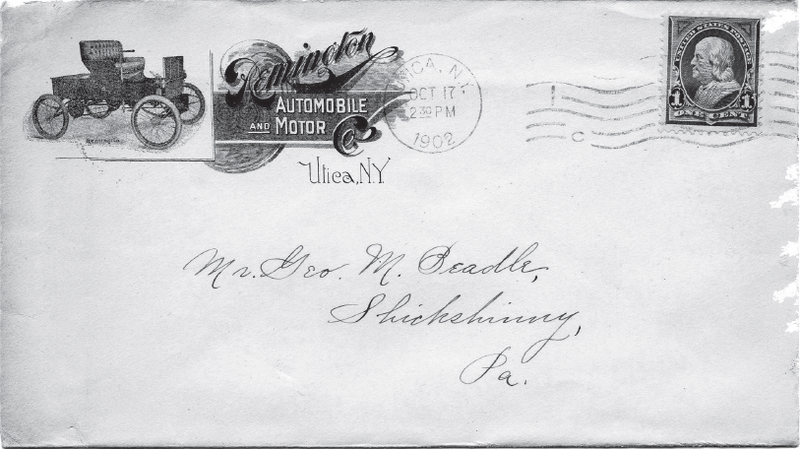 the Remington Automobile and Motor Co., Utica. N.Y.
New York City at 1597 Broadway. 38 horsepower gasoline engine (made by others) and with a hydraulic transmission. entire venture failed with having produced only one prototype vehicle. Jersey. Delivery is expected by November 1st 1914. New York, where the venture failed in 1916. A corporation known as the American Sleeve-Valve Motor Company, with executive offices at Philadelphia, Pa., is preparing to manufacture a new sleeve-valve motor. E. Remington, of arms and typewriter fame, is chairman of the board; Philo E. Remington, of the same family is president, and Wilfrid Hartley, formerly treasurer and factory manager of the Remington Arms Co., is vice-president. 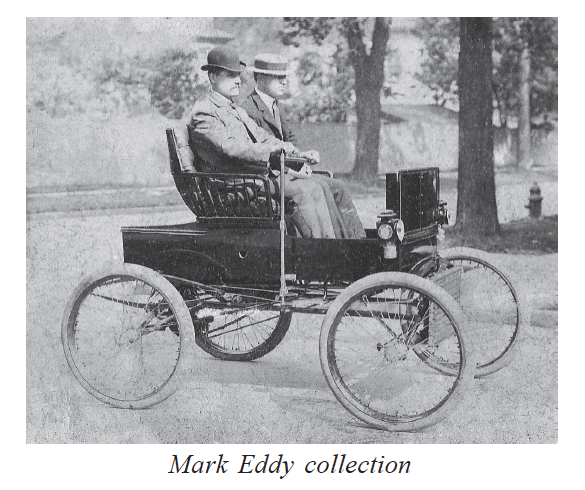 Among the other officers and directors are E. R. Hollander, former president of the American Fiat Sales Co.; T. M. Fenner, of the Wisconsin Motor Mfg. Co. and C. P. Hollister, formerly with the Stanley Electric Company. No further information on the firm is known, and it is believed that the company never built any engines of any type. Philo E. Remington become enamored with the phonograph record, and his next firm, the Remington Phonograph Company, organized in July 1920, actually produced a handful of operatic titles under the Reminola and Olympic labels from its factory and recording studio in Long Island City, New York. He failed to take into account the overwhelming competition and the firm was bankrupt within the year and subsequently reorganized as the Remington Radio Corporation in June of 1922. This firm failed after Philo E. Remington and his officers and directors were indicted for conspiracy to use the mails to defraud in relation to sale of Remington Phonograph Company stock. After almost two years of litigation, the case abruptly ended on June 14, 1924, when a Federal judge ruled that the indictment against the men was faulty.